To the left you will find a selection of useful links based on research we did while in the NICU with our son. If you have any links you would like us to share do please contact us. Always accept help from friends when offered, no matter how small. And if it's meals always, always say yes! 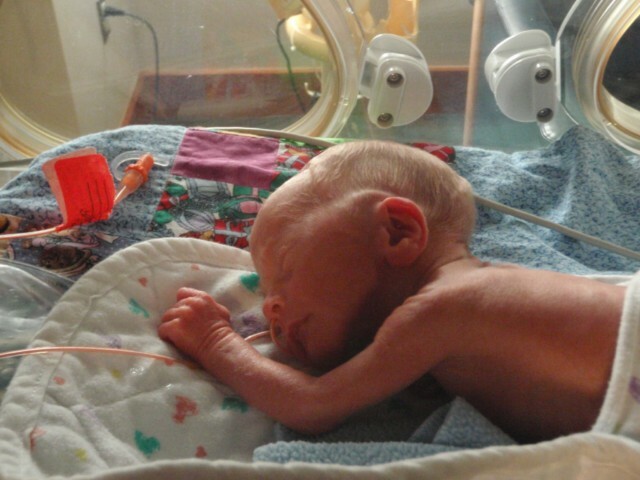 Reach out to other parents in the NICU, they are potentially going thru some of the same things as you, and it helps to talk to someone that truly understands! If pumping and the hospital allows you to freeze your milk in bags, only put 4oz per bag and lay them flat to freeze, this will help them thaw faster and generally you only use 4oz bottles for quite some time! Another pumping tip, use a hands free pump bra. I would pump and sit next to the isolete, and put my hands on my son when in the early days I could only hold him an hour a day. This is still a form of kangaroo care and it actually is supposed to help your milk production and any touch by mom helps your baby. Keep a journal or blog of everything that happens daily (we're working on a NICU Journal) but I blogged and it was so helpful some days to look back and see how far he'd come, plus, family and friends can follow along in your journey. If your hospital allows it, bring your babies own bedding in for their isolete. They let me start using Spencers bedding... so when he finally got home, it wasn't so foreign. Get a hand sanitizer with aloe and use it, the hospital hand sanitizer KILLED my hands and you use it so often, this will give you a little relief. Talk and sing to your baby...I would sing "Hush little baby" to Spencer everynight and it still calms him to sleep today! Find a local photographer that can come in to do pictures, OR, schedule one to do newborn shots when you're finally released. We didn't do either, other than the Bella Baby the day we were released, until Spencer turned 6 months. A friend actually bought the little blocks and held them by the incubator weekly, ex "Spencer 1 week old" in little baby blocks, was adorable and I wish I had done that!! When you find a nurse that you like for day and one for night shift, ask if they can be your primary. It's important to feel really comfortable with your childs main caregiver. All our nurses were pretty amazing, but we did have a primary for both day/night when they were on duty, and they rotated the rest of the time.